Welcome to the fantastic world of BSM Finest Treble Boosters! Hello, we would like to introduce our gorgeous Treble Booster machines, exclusively handcrafted by BSM for you. We hope you will enjoy your ride to a new territory of musical tone and flexibility. If you have any questions concerning our products, our tech-head and mastermind Mr. Bernd C. Meiser would be happy to talk to you. So don't hestitate any longer and send him an email to info@treblebooster.net to contact him directly. You can download a pictured short-info sheet with all available boosters, this will give you a complete first overview about our product range. You can also download a short text summary about all available boosters. The "RPA California II" booster is the soul-mate of our California unit, complementing it with a different goal in mind. 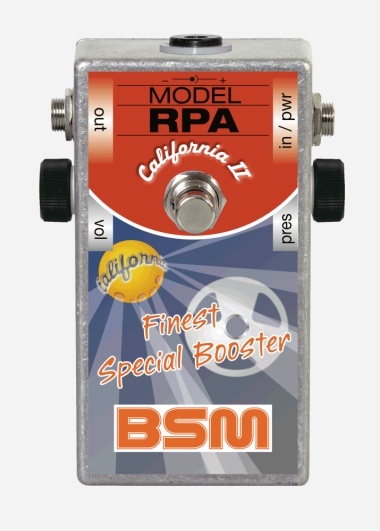 The new RPA California II now calls for the correct pickups. The California II makes use of the free space gained via a volume pot. This allowed for the opportunity to map Blackmore's tone even with small amps. 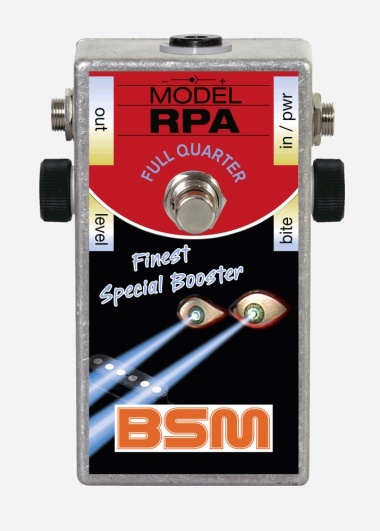 The "RPA Full Quarter", developed for fat single coil pickups like the "Schecter F500", the OBL 450XL (or similar) double blade humbuckers that Ritchie Blackmore used in the 1980 and beginning of the 90s. The pedal ensures no muddy or dull sound with powerful pickups like these in the operation of conventional amps to achieve a dynamic transparent sound.